2 The cart is full of fruit, most of it looks a little soft and over-ripe but it should still be edible. 4 A number of ratty, moth-eaten furs are attached to a board at the back of the cart, you could probably sew a couple of them together to make a half-decent, warm garment. 5 Several dusty bottles are stacked in the back of the cart, on the side of it someone has crudely painted a depiction of a bunch of grapes. 6 The cart is selling fresh bread, however as you approach you see someone, having purchased a loaf, bite into it, swear loudly and then spit out a number of small stones. 7 The wagon contains meat in various states, a lot of it has an unhealthy greenish tinge to it and fat flied buzz lazily overhead. 8 Inside the rickety cart are a number of tankards, empty wooden barrels and even some signs that have been salvaged from taverns that have closed and gone out of business. 9 An assortment of bed sheets, clothes and curtains are piled haphazardly into the wooden cart, there are small splotches of what might be dried blood on the sheets. 11 There is a pungent odour emanating from the direction of the vendor, as you get near you can see that he has several crates full of salt on his cart containing large and fragrant fish. 12 The cart has the word Debtors Rest stencilled crudely on the side of it, there are three bodies in the cart and a large apron-wearing man stood by the side of it holding some pliers, as you look he smiles at you revealing perfect white teeth. 13 Nailed to the sides of the cart are a number of rabbits, birds and other meats that have obviously been hunted or poached from the local forests, inside the cart is more of the same. 14 A slick-looking gentleman is selling his miracle elixir cure-all from the back of a gaudily painted cart, as a crowd gathered a stooped old man with a cane approaches, he is given a sample of the elixir, shouts with joy, throws down his stick and skips off merrily down the street. 15 As you approach, the vendor hails you and tells you that he is selling 'treasures from the deep', items salvaged by his expert team of explorers from coastal wrecks, his wares seem to consist of a number of badly corroding metal fixtures, some sealed barrels of rum and a wooden figurehead depicting the torso of a beautiful woman, although much of the paint has flaked off it. 16 The cart is selling delicious mince-pies at an extremely cheap price, any attempts to elicit the source of this wonderful meat are simply met with a knowing smile and a tap of the nose by the vendor. 17 A young boy is attempting to sell some scruffy looking kittens from a wooden crate at the side of the road. 18 A local artist is attempting to sell a series of sketches, he offers to produce a portrait of a customer using charcoal whilst they wait for 5SP. 19 It's impossible for you to get near enough to see what's in the wagon, the seller is surrounded by an angry crowd demanding refunds for his shoddy produce, it looks as though this could turn into a full-scale riot any moment. 20 The cart contains an assortment of worn weapons and armour missing links or slightly damaged, they are available at 75% of normal cost, but each time they are used (for a weapon) or the PC is hit (for armour) there is a 20% chance that the item falls to pieces and is effectively lost. 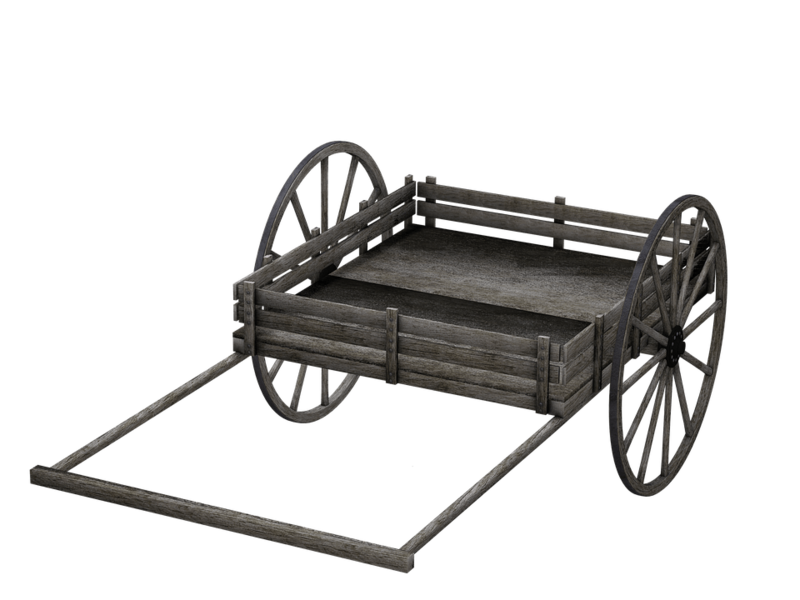 Wooden cart image was taken from Pixabay, classified as CC0 Public Domain. This entry was posted in Random Things and tagged adventure ideas, idea generator, idea generators, random ideas, Random things, street vendors by John Large. Bookmark the permalink.